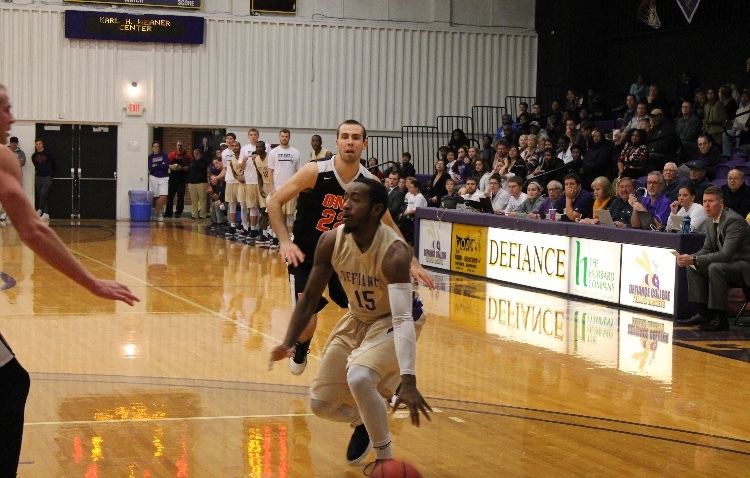 (Defiance, OH) The Defiance College Men’s Basketball team played in their last home match against the Earlham Quakers on this past Valentine’s Day. The Jackets came into the game looking to end a downhill skid against the Quakers, who came into this event at 3-12 in the HCAC. Earlham came out with a flare to start the game, going on an 8-0 run. The Jackets were able to put a run of their own together, though throughout the half fighting back to go into halftime trailing 35-29. The Jackets fought away at Earlham’s lead throughout the second half, putting together a few runs of their own, including a 7-0 run that put the game at 50-47 Earlham. The Jackets were able to continue to fight, and were down 2 with several seconds left. They were not able to pull off a buzzer beater, and lost to the Quakers 68-66. The Jackets only shot 33.8% from the field versus Earlham’s 46%. The Jackets were able to collect 41 rebounds and force 17 turnovers. The Jackets were also helped with 30 points off the bench tonight. The Jackets were led in scoring by Allante Wheeler who had 17, and Avion Franklin followed up with 14 of his own. Randall Aikins Jr was able to add 16, along with Ben Singer adding 13. Wheeler also led with 8 boards, followed by Jordan Maschino with 6, and Aikins and Noah Goodrich with 5 of their own. Several players were able to add 2 assists of their own for the Jackets. After the game we caught up with freshman Elijah Pennington, who had this to say, “We played really hard, but we came up just short against the Quakers. The Jackets play their final game this Saturday, against the Hanover Panthers, at Hanover. If you see a Men’s Basketball player, make sure you say goodluck. As always, Go Jackets!